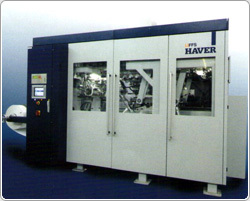 At the world's largest packaging trade fair in Dusseldorf, Germany, the HAVER Group presented itself jointly with its subsidiaries Feige Filling GmbH and BEHN + BATES at a 500 m² booth. Among other things, a new, interface-free filling centre was visualised in this presentation - ranging from empty drum storage to load securing. 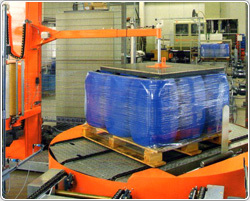 An automatic high-performance storage system using the drum pack procedure, a fully automatic empty drum feed to the drum filler, a pallet filling robot as well as palletising and hooping make it possible to achieve a nominal output of approx. 100 drums/h. 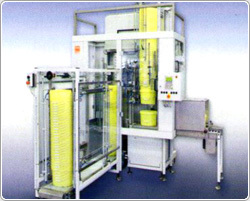 The cooperation between Feige Filling and Sommer GmbH & Co. KG offers joint customers in the paint, lacquer, chemicals and oil industry turn-key systems comprising everything from mixing and filling of solid and pasty products to palletising. 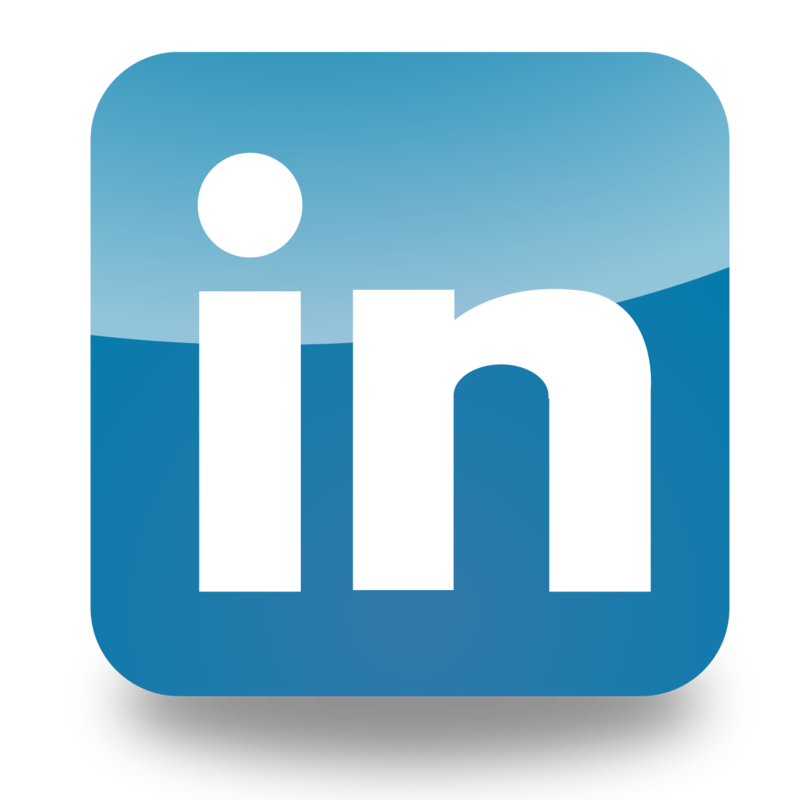 The entire process technology is supplied from one source without any interfaces. 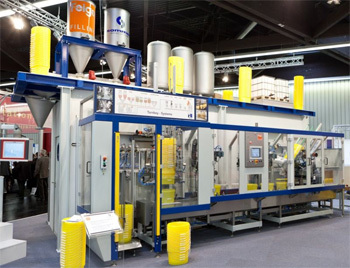 A novel product was also presented at the trade fair: the automatic pail filling machine model 410, which is centrally operated via the Feige touch panel. The Feige system offers a modular design and is compiled individually. 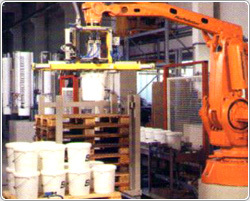 The line includes the pail denester model E1200 with refilling position at floor level, uninterrupted feed of the pails and integrated safety system. 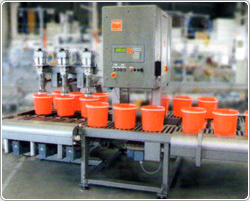 A conversion to other pail sizes can be implemented just as unproblematically as a change of stacking distance or range. 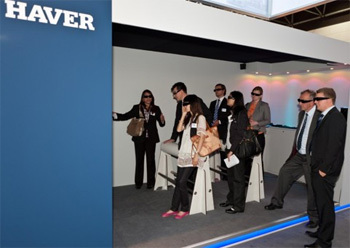 The new concept enticed visitors and interested customers to visit the booth in large numbers, so that both Feige as well as Haver & Boecker and Behn+Bates concluded the last day at the trade fair with a very satisfying summary. The desire for increased performance and reduced maintenance, material and cost expenditure was taken into account for the new developments and enhancements of all three exhibitors. For the first time, the HAVER Group also presented an extensive service area, which was also used by the subsidiary companies Feige Filling and Behn+Bates to present their wide range of services. 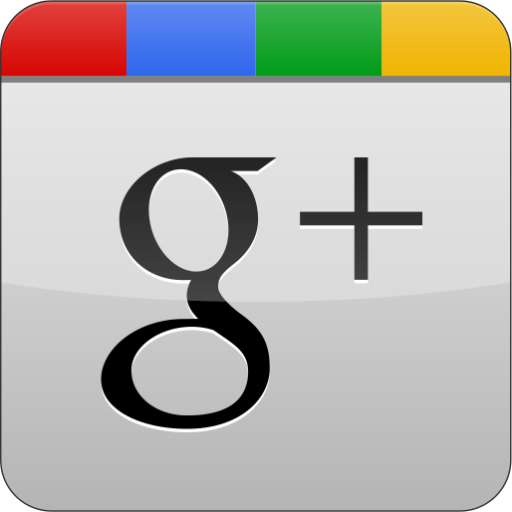 In doing so, FEIGE FILLING focussed on tele-service, which serves the purpose of trouble-shooting per remote diagnosis. 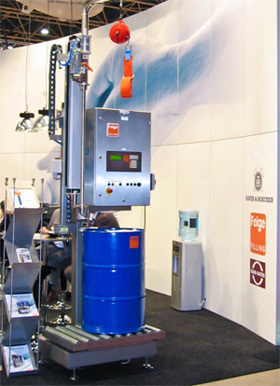 An Internet live link to Feige filling equipment demonstrated different immediate measures and informed the interested booth visitor about the versatile possible uses. 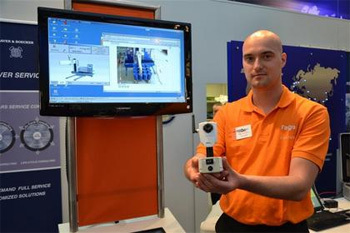 Feige Service-CamThe FEIGE service cam was for the first time introduced at a trade fair. 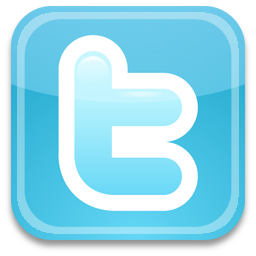 It serves to transmit live images to support trouble-shooting. 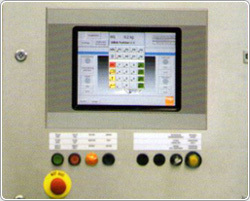 The service cam is equipped with wireless IEEE 802.11g as well as an Ethernet network interface. The integrated rechargeable battery pack facilitates the mobile use of the system. The resolution in the mega-pixel range permits an accurate analysis of prominent items. Owing to its high light sensitivity, the service cam can also be used under poor light conditions. 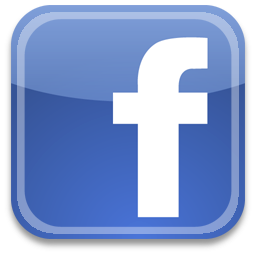 Simultaneous MPEG-4 and motion-JPEG currents permit a system optimisation as far as image quality and band width are concerned. The latest service innovation is the drum inspection system VaDIS (video assisted drum inspection station). 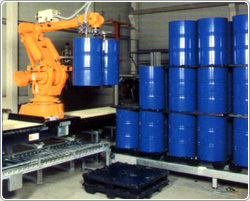 A digital scan camera automatically checks drums for foreign objects prior to filling, thus ensuring an uninterrupted quality assessment record. The drum concerned is blocked from further transport. 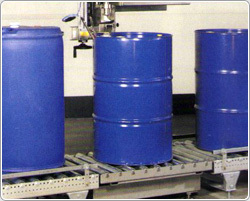 The images recorded by the drum inspection system are archived and serve as quality assessment record. 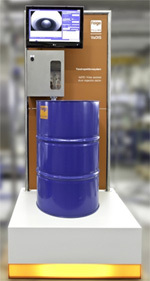 In the meantime, the first order for the drum inspection system has been received from the chemicals group Dow Germany. At the Stade site, a drum inspection will be installed upstream of the filling unit, which serves to assure the quality of the Dow products. A joint solution had been in the making for a long time already. 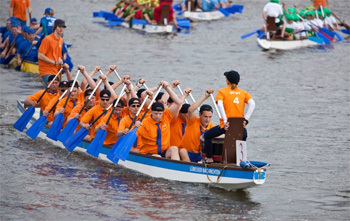 The idea of presenting Feige regionally in a sporty event and to therefore participate in Lübeck's Dragon Boat Festival was immediately supported by management. Here too, Feige employees demonstrated their team spirit and formed a powerful team on land and on water. The festival is deservedly called "Northern Germany's largest company outing" and the largest carnival on the water, because after all, approx. 100 paddling teams were registered. Each institution is given the opportunity of presenting its best side and to call attention to itself by means of its presentation. During the race, it was not only necessary to demonstrate the team's speed over 400m, but also its creativity as far as the choice of fancy dress was concerned. Many training units were completed to demonstrate market leadership in "synchronised paddling". Finally, "Feige-Power" managed to win 24th position. A terrific performance, not least achieved due to the vociferous support of the colleagues who had travelled along to the event. Taken by the spirit of the team and the atmosphere across the entire festival site, Andreas Hahner promised a renewed participation in 2012!